Lots of people have Spektrum radios, but Spektrum don't currently make a small receiver compatible with CPPM. This is a problem as a lot of drone flight controllers don't support DSM2 (one of the Spektrum modulations). The solution is this this OrangeRx receiver. The R610V2 works with Spektrum DSM2 2.4GHz transmitters and is compatible with CPPM and PWM radio inputs. The CPPM functionality is an excellent feature for use with multi-rotor flight controllers such as the Naze32, APM, MultiWii and others. This single line connection removes the weight and mess of additional wire leads for each individual channel. This is ideal for use on small frames where space is at a premium. Furthermore the OrangeRx R610V2 takes things to the next level by utilizing dual antennas providing true signal reception diversity! Add to this programmable failsafe on binding, ultra fast brown-out recovery and wide voltage input range. 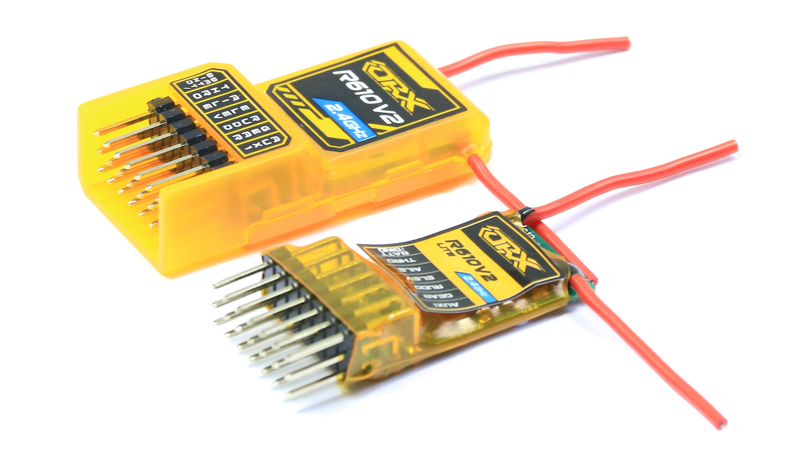 The end result being an unbeatable value for the money multirotor/aircraft receiver! All R610V2 OrangeRx receivers are QC tested using our latest method that ensures range checking takes place as the receiver is programmed. Simply put, if the R610V2 cannot pass the range check it cannot be programmed, this ensures 100% of R610V2 are guaranteed to work flawlessly. The R610V2 is available in two versions, cased or uncased. The cased version weights 9.8g and gives it a bit more protection, while the uncased version is smaller and only weigh 3.9g.